We all want to do our part to protect the environment and maintain overall public health. We also want to find ways to dispose of our waste without hurting ourselves and the planet. In order to do so, we need to know the rules and regulations that the EPA (Environmental Protection Agency) has set in place. Also, we need to know the six key pollutants and how to properly dispose of them. Established in the latter part of 1963, The Clean Air Act is a federal law that controls air pollution levels on a national scale. This act works in conjunction with the Environmental Protection Agency to create and instill regulations that will protect humans from toxic air pollutants. The first major expansion to this bill passed in 1970. This expansion requires in depth analysis of industrial and mobile pollutants from state and federal levels. The EPA was actually founded in 1970 to help consolidate research and analysis so it is all under the roof of one agency. In 1990, The Clean Air Act expanded to address issues concerning acid rain, air toxicity, acid rain, and depletion of the ozone. The Clean Air Act expansion that passed in 1990 also included a national permit program. This program covers many large industrial and commercial properties. Businesses must respond to toxic chemicals being released in the air. 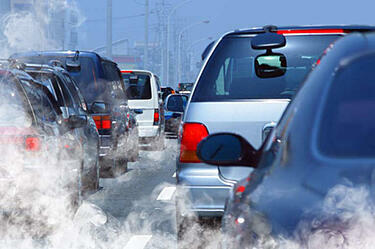 Businesses must measure the quantity of air pollutants being released. Businesses must have plans in place in order to minimize and control the pollutants being released. Businesses in non-attainment areas are required to have a permit if they let out 10-50 tons of VOC's (Volatile Organic Compound) per year. Businesses are required to report to the EPA periodically. Permits are issued locally, and if a business does not report their air quality levels, the EPA gets involved. The public will also have an opportunity to view the permit by calling the EPA directly. These permits require a renewal every five years. The EPA requires businesses to report on how much of the following chemicals are being released into the air. Carbon monoxide is a very toxic pollutant that forms when there is a lack of oxygen to make carbon dioxide. Carbon monoxide can cause a lack of oxygen in one's body, which can become life-threatening very quickly. For overall health and safety of the public, the EPA has set the following carbon monoxide standards: 9 parts per million for eight hours and 35 parts per million for one hour. The ozone is made up of a toxic blue gas and it has a very distinct (and unpleasant) odor. This gas is made up of three oxygen atoms. Breathing in this gas can cause the public severe respiratory distress, and even death. Bad ozone levels can even cause distress to our planet's vegetation. This metal is found in our environment organically, and it is also found in man-made items. The most well-known source of emissions of lead comes from fuel. Fuel from our vehicles produce the most lead in our air. Also, fuel from air crafts emit exponential amounts of fuel into the air. This is a highly reactive gas that is emitted from vehicles and power plants. It is a known contributor to bad, ground-level ozone levels. In January 2010, the EPA issued a standard for nitrogen dioxide at 100 parts per billion, over a one hour span. If this gas reaches dangerous levels, it can cause the public severe respiratory distress. This mixture of small particles and liquid droplets have a number of components to it. These components include dust, acids, soil, organic chemicals and metals. Particles that are 10 micrometers or smaller are able to be breathed in by humans and animals which, in turn, can cause severe distress. This highly reactive gas is emitted from fossil fuels (via power plants) and industries. This gas is released when metal is being extracted from ore. The EPA issued an air quality standard of 75 parts per billion over a span of one hour. What can be done to protect air quality? Many companies have been able to control what is being put out into the air by trusting in a hazardous waste company. These companies are able to dispose of waste containing these harmful chemicals without putting the public's health at risk. Companies have been able to save a lot of money on waste disposal and keep within the State and federal regulations by utilizing these amazing companies. Using these waste disposal companies protects companies from being reprimanded due to improperly disposing of waste.